I make the trip to the Shrine from Iron Mountain to L’Anse almost every day. It’s an hour and a half drive and for some, that may seem long, but if we were in New York City…that’s just a good commute! And my commute is a lot more lovely than any NYC commute. One day this summer (actually a few times this summer, but only once when I got a picture) I spotted a moose at the usual place: a swamp about ten miles south of Covington, commonly called the “Moose Swamp.” If you’re traveling in the middle of nowhere in the Upper Peninsula and you see cars parked on the side of the road….look around. 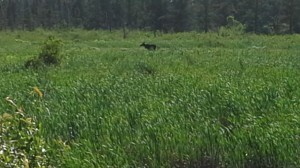 You may spot a moose!